Join our free webinar detailing what it takes to make your Git deployment highly available, including some of the trade-offs to expect. If you’ve got questions, this webinar is your chance to get answer from our Senior Product Manager and resident expert Doug Robinson. What does “high availability” mean in practical terms? Join our free webinar detailing what it takes to make your Git deployment highly available, including some of the trade-offs to expect. If you’ve got questions, this webinar is your chance to get answer from our Senior Product Manager and resident expert Doug Robinson. On the surface, ClearCase and Git seem like polar opposites, yet setting architecture aside, they have interesting similarities. A deeper understanding of ClearCase and Git will ease the migration planning process. • How ClearCase MultiSite, ClearCase UCM, and ClearQuest fit into the picture...and more! Don’t miss part two of our Subversion and Git High Availability webinar series taking an in-depth look how global enterprises are achieving 100% availability with Subversion and Git. Global enterprises demand highly available SCM systems to power their development and delivery pipelines, but what does it take to get 100% availability with Subversion or Git? In this webinar we’ll take a look at best practices and hardening techniques learned from years of administration experience. Git is the developer's tool of choice, but Git tools and workflows are also the best way for large software development shops to improve their quality and delivery pace. In this webinar 451 Research's Donnie Berkholz will touch on Git's popularity with developers and then explain in detail how Git tools and workflows are fundamental to continuous delivery. WANdisco's Randy DeFauw will then give a short take on how to make Git robust enough for the largest environments. After watching this webinar enterprise software managers and SCM administrators will realize that Git may be the best thing they were ever scared of. SCM systems are the cornerstone of modern continuous delivery and DevOps. Is it time to update your system? If you're a development manager or ALM expert considering a move from ClearCase to Git, join us for this webinar where we'll review the why and how of making the switch. GitLab provides streamlined social coding and collaboration for Git development teams. But under the hood it's a powerful enterprise Git management platform. In this webinar we'll present best practices for managing permissions and users with LDAP and Active Directory, working with large binary files, code reviews and workflows, and clustering and replication. From security to performance and disaster recovery planning, this webinar will guide you to a rock-solid GitLab deployment. office to over 5,000 across four continents? • How do you monitor performance and ensure 100% uptime? • How do you ensure compliance with security policies? Despite its popularity and growing number of enterprise deployments, Git does not offer its own access control. What does this mean for security? In this webinar we’ll review the options for Git access control and how these are implemented by Git management tools. 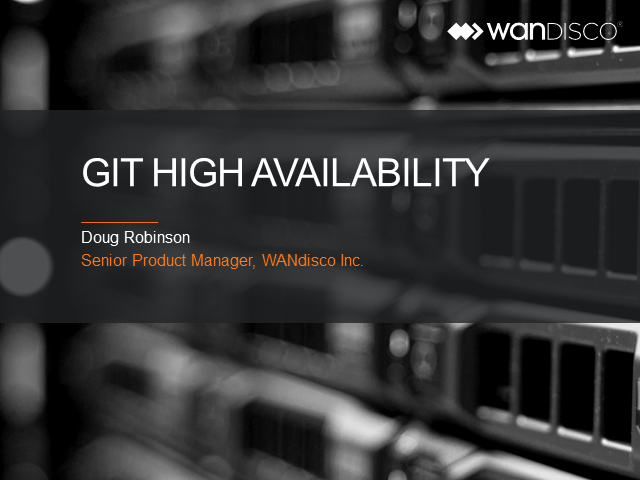 WANdisco allows large, widely distributed development teams using Git to truly work as if they are in the same location with continuous availability across the enterprise. Our webcasts cover topics such as continuous delivery, DevOps, scalability, availability, performance, access control, and migrating to Git.